Every action has a reaction. This has certainly been true during the restoration of the nomad and sadly the reaction is normally not positive. This last week can attest to that. After all the hurdles, sagas and dramas building this car it was now time to get an engineer to look at it so that hopefully I can get it registered and drive the wheels off it. Some years ago I had an engineer have a cursory look and he pointed out a number of things but since then there have been many changes and now the NSW Roads and Maritime Services have a Vehicle Safety Compliance Certification Scheme (VSCCS). Just looking at the name of the program immediately conjures up a bad picture of bureaucracy and as is mostly the case first impressions are correct. Our American friends would wet themselves laughing at our local requirements and then would be stunned to realise it is not a joke and in order to get your modified car on the road you must comply. Understanding this my mantra is to make it legal as per the specifications so as to avoid any future surprises. After months sorting out a lot of little things the day arrived when the engineer came to check out Project Nomad. I had documented and emailed him in advance most of things I knew he would look at and had pictures, diagrams and receipts so he had an idea of what to expect before seeing the car. I ended up with a to do list of eleven items which overall wasn’t a bad outcome. The big ticket item was the steering column. 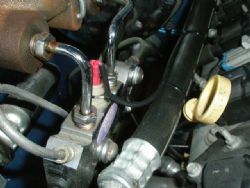 Under todays laws if you install a motor that is 20% larger in cubic inches than the original you must install a collapsible steering column with breakaway upper mounts. 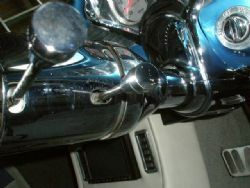 I am currently doing the research on this as a RHD collapsible floor shift chrome tilt version may be a bridge too far. Other requirements are relatively straightforward – a weighbridge ticket, decelerometer brake reading, exhaust diameters, engine and transmission mounts brand and part numbers, noise level test, seat information, copy of US registration papers and so on. 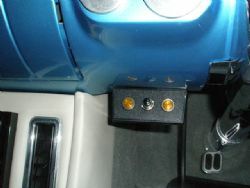 Another new addition is the need to have a brake fail safety switch wired into the dash. This has now been done by Johno’s Auto Electrical Service in Revesby and the speedo, tacho and fuel gauge have also been sorted. After I get all the stuff done and the additional information it will be back to the engineer. Going back to my opening statement of every action has a reaction – this was evident when the four wheel alignment was done. 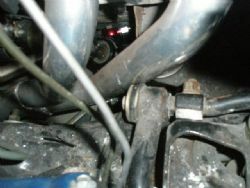 The car now tracks beautifully however unbeknownst to me to achieve this they shim the a-arms. This has led to the a-arms now being tight against the extractors which now need to be pulled off, massaged, recoated and installed. Just more money…..